Disney knows a thing or two about educating the masses while entertaining them, I would even go as far as to say that they are the hallmark of the edutainment industry. Yet, when it comes to their smallest audience, I am starting to see a glaring, but specific, lack of insight. Disney’s Hollywood Studios has Playhouse Disney, Beauty and the Beast, Voyage of the Little Mermaid, and, soon, Toy Story Mania, enough to please any small one. The Magic Kingdom is tailored to families and children, you only have to check the queue lines in Fantasyland to buy in to this one. Animal Kingdom has Finding Nemo the Musical, Festival of the Lion King, the Boneyard, and lots of wild animals. Yet Epcot, which has always appeared as the most adult themed park at Walt Disney World, has very little to offer the very little. In an attempt to change this, the Kidcot Fun Stops were brought to World Showcase. The Fun Stops were a great way for children to kill a little time while their parent(s) ran amuck shopping, dining, and taking in the atmosphere. The first attempts to entertain the young masses at these Fun Stops were, at best, plain and lacking appeal. Over time these generic crafts gave way to activities that were more appropriate to the home country each Fun Stop was so meticulously themed to. Italy had paper gondolas, Norway constructed cork trolls, and Japan had very thin paper swans. For the past few weeks we have been looking at the crafts from Epcot’s Kidcot Fun Stops (a trip we will continue on). And while these are fabulous activities to bring the ideas and spirit of diversity into your home or classroom, they are lacking in terms of what one would expect from the vast resources of the Disney family. The point is, children do not go on vacation to see what they experience every day. They want something new, an adventure, an escape, a broadening of their horizon. To see edutainment for the younger set done right, you do not have to look far. A few miles down the road is Disney’s Animal Kingdom and their Kids’ Discovery Clubs. Again the settings for these pit stops are meticulously themed, but there are messages to be delivered. As a “researcher” each child is actively engaged in questioning and developing their own ideas as they interact with the Cast Members in each area. At the end of the experience the children have and idea or concept to take away with them and think about, not a craft that will most likely be damaged in a suitcase on the way home because it was buried at the bottom of the bag. I would love to see an overhaul of the Kidcot Fun Stops. In fact, I’d love for Disney to call me and ask me for my ideas, and how to implement such a change. As for ideas, the new direction couldn’t be simpler. Take the lessons learned from the Kids’ Discovery Clubs, engage your audience, and develop individualized activities that harvest the vast history of each country, without talking down to children. What child wouldn’t want to learn a few basic moves of Karate or Tae Kwan Do (you know, just enough to take that bully of a big brother down)? Every child can learn to keep a beat with a set of maracas in a mariachi band. Let them get dirty by planting a few plants or seeds in an English Garden. 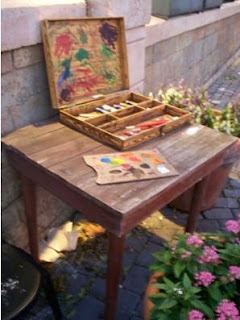 Let children release their inner-artist with some sugared water-colors to paint a beautiful, and delicious, work of art in France. Every country has a soul, a spirit that Epcot’s World Showcase attempts to capture, which it does in fine fashion for adults who already know something of the corner of the world they are visiting. Why wouldn’t Disney want to find a way to pass that spirit on to a child? A child who could one day turn that moment, that spark, into a true voyage they would never forget.